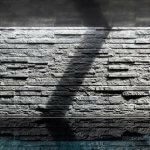 They also wanted a full power swimming machine, automatic cover, natural stone finishes (throughout the pool and up the walls and stair) and cold white lighting shining across the pool (from under the cantilever steps ) to create the appearance of light shining from low level into a water filled cavern. 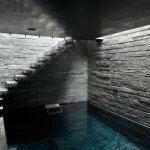 The biggest challenge with this pool was creating a pool to the absolute boundaries of the available site. Coordination of services through the main building structure was meticulous. 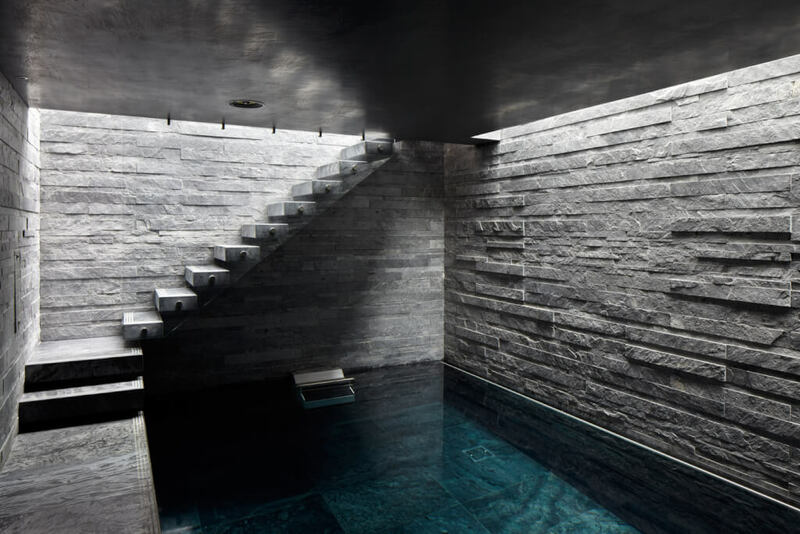 The pool was chlorine free with no smells or corrosion issues, which was very important due the occupied part of the house being just above the pool cave. 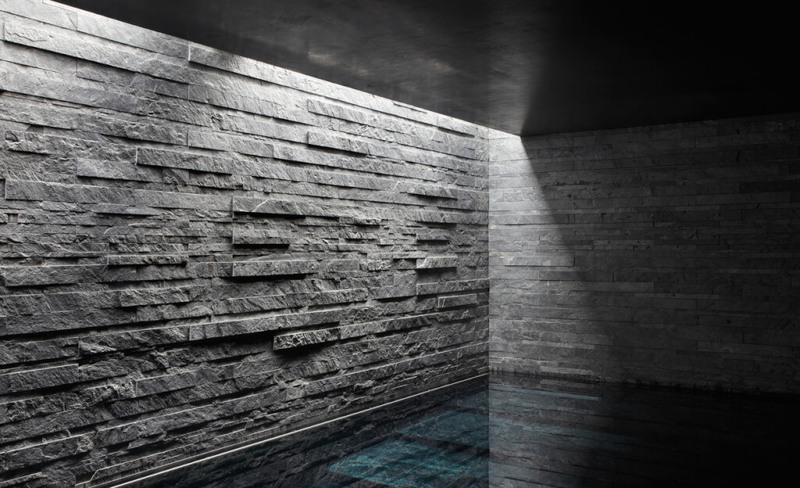 The walls were tiled with natural finish, uncalibrated stone strips using a grey/silver granite. The ‘Ramdom’ finish was painstakingly planned, drawn, redrawn and then applied to give a very unique set out. 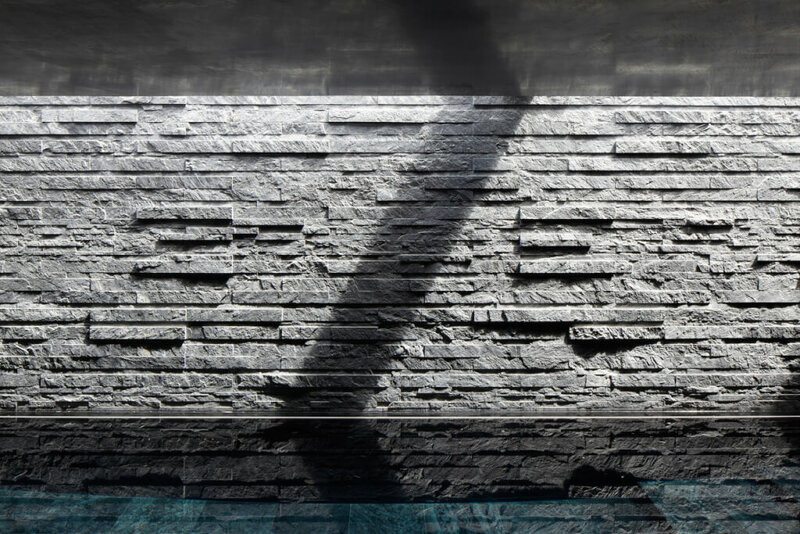 Below water line, the same stone was used on the walls, but with a honed smooth finish and large format stone pieces were laid on the floor. 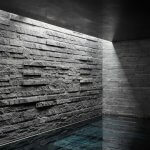 The pool hall was protected by a high quality AHU system which was connected to the pool cover for energy saving when the pool cover was on.